For our newest series, we’re tapping into the expertise of Dr. Stephanie Smith. 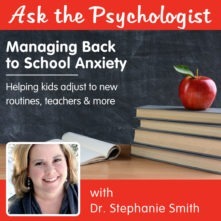 Dr. Smith is a mother, clinical psychologist, author of Dr. Stephanie. Each month, she’ll answer one question from fellow parents. 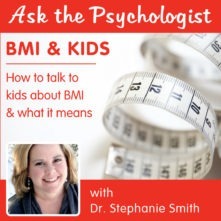 Have a question centered around health, kids or food for Dr. Stephanie? Comment below and let us know! My daughter was recently diagnosed with ADHD and has begun taking medication to help her better focus in school. She was already a light eater and slightly underweight, but the medication has decreased her appetite even more. I always try to feed her a larger breakfast before she takes her medication, so I know she’s at least getting some protein and nutrients early in the day. Most days, she barely eats anything for lunch or dinner though. Any advice on how help increase her appetite? According to the Centers for Disease Control (CDC), about 6.1 million children in the United States had been diagnosed with Attention Deficit/Hyperactivity Disorder (ADHD) in the United States as of 2016. ADHD is a disorder that affects a person’s ability to maintain attention and concentration. Those diagnosed with ADHD can struggle to get work done in a timely fashion at home, work and school; social relationships can be tough to maintain as well. Luckily, there are several, well-researched options for the treatment of ADHD. Behavioral therapy/counseling is typically recommended as a first option. This type of therapy involves a psychologist working with both the child and their family to implement strategies to increase desired behaviors (following directions, controlling impulses) and decrease those that are undesirable (disruptive behaviors). Accommodations at school are also an effective line of treatment. These might include: allowing for movement breaks throughout the course of the day, allowing extra time for tests, and strategically positioning the child in the classroom to reduce distraction. Taking the medication at a different time of day. Just as with any medication, time of day can make a big difference. Of course, you and your providers will need to keep in mind what time of day you want the medication to be at its peak efficiency as well (likely school hours). Consider a different medication. There are many different types of stimulant medications to choose from. Some last through an entire 24 hour period, some for much shorter periods of time. Work closely with your provider to ensure that you find one that works best for your child. Add a protein shake mid-day. In consulting with a psychiatrist colleague of mine, I discovered that she often recommends kids drink a good-tasting, high protein shake around lunchtime when weight and appetite are affected by stimulant medications. Take a drug holiday. Some families find that their kids benefit from the effects of stimulant medications at school, but notice that on school vacations and weekends, they can do just fine without. This then also allows for their appetites to have a chance to normalize. As mentioned above, the most important and first step when you notice something amiss with your child’s appetite is to call their physician and work with them on a solution. Luckily, there are a lot of options when it comes to effective treatment for ADHD; hopefully, you will be able to find one that works for you and your family soon. DISCLAIMER: Please note that the information in this article is intended for informational purposes only. It should not be used as a substitute for psychological or medical care. If you are experiencing a mental health emergency, call 9-1-1. 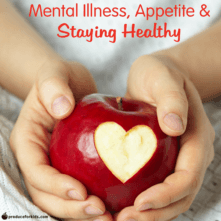 1 Pings/Trackbacks for "Ask the Psychologist: ADHD & Appetite"